When I first saw Surface Pro, the Microsoft rep giving me the demo did a simple test. He stood Surface Pro right next to Surface, with the same start screen, and asked me if I could tell the two apart. The planar dimensions of Surface Pro are identical to Surface RT. Both feature the same sized 10.6-inch display, the same capacitive Windows button and the same 1-inch border around the screen. Looking head on, the only way you can tell the difference between Surface Pro and RT is the former’s 1080p display does make text a bit sharper. Turn the two tablets to the side and the differences quickly become evident. Surface Pro is over 40% thicker than Surface RT (13.7mm vs 9.3mm). While the latter was of a similar thickness to an iPad with Retina Display, Surface Pro is clearly in a different league of dimensions. The thickness of Surface Pro doesn’t really impede its portability, but the weight definitely makes it a lot less pleasant to carry around. Surface RT was already heavier than the competition but it hid its weight well. Surface Pro is just heavy for a tablet. I wasn’t originally impressed by the Surface RT form factor, but in switching between the RT and Pro models I immediately wish that Surface Pro came in the RT chassis and Surface RT came in something even thinner and lighter. Shift the comparison to Ultrabooks however and all of the sudden Surface Pro seems quite light. It’s lighter than an 11-inch MacBook Air and Acer’s 11.6-inch Aspire S7 (although with optional keyboard cover it is heavier). It’s all about perspective. Compared to an iPad, Surface Pro is heavy, but compared to an Ultrabook or MacBook Air it’s light. The Pro model embodies the vision Microsoft had for the Surface family: to create a new type of device somewhere between a tablet and a notebook. That’s not to say there’s not room for improvement in the physical department. Surface Pro will likely go on a diet as it’s given more power efficient silicon, but even then you’ll always be able to build something thinner and lighter based on slower hardware, or go thicker and heavier with a notebook. The fit and finish of Surface Pro are just as good as Surface RT. The tablet is built out of the same injection moulded Magnesium process (VaporMg) as Surface RT, however the chassis itself is somewhat simplified. While Surface RT featured three discrete VaporMg components (frame, back and kickstand), Surface Pro is made up of only two (single piece frame+back and kickstand). The result is no different to the end user, but the simplification on the assembly side is likely better for Microsoft. I am fine laying the same praise on Surface Pro’s build quality as I did on Surface RT. The unique finish doesn’t feel like the aluminum we’re used to seeing on iPads, and definitely feels better than the plastic we’ve seen elsewhere. The VaporMg surface doesn’t feel like it would scratch easily, and after a few months with Surface RT I don’t see any visible scratches on my unit. Surface Pro’s construction feels more utilitarian and understandably more oriented towards productivity, just like its little brother. I still believe that the Surface lineup is as much about Microsoft showing that it too can build high quality devices as it is about getting into the tablet market. If we compare it to the iPad, Surface Pro feels just as well built, if we compare it to every Windows RT and Windows 8 tablet or notebook on the market today - it’s worlds better. Say what you will about Microsoft entering the PC hardware business, but as of today Microsoft builds the best Windows RT and Windows 8 hardware on the market. If I ran a PC OEM I wouldn’t be angry at Microsoft, I’d be angry at myself for letting this happen. Surface Pro retains the integrated kickstand from Surface RT, although the kickstand has been beefed up to accommodate the heavier tablet. Surface Pro’s kickstand keeps the device propped up at a fixed angle of 26-degrees away from the vertical axis. 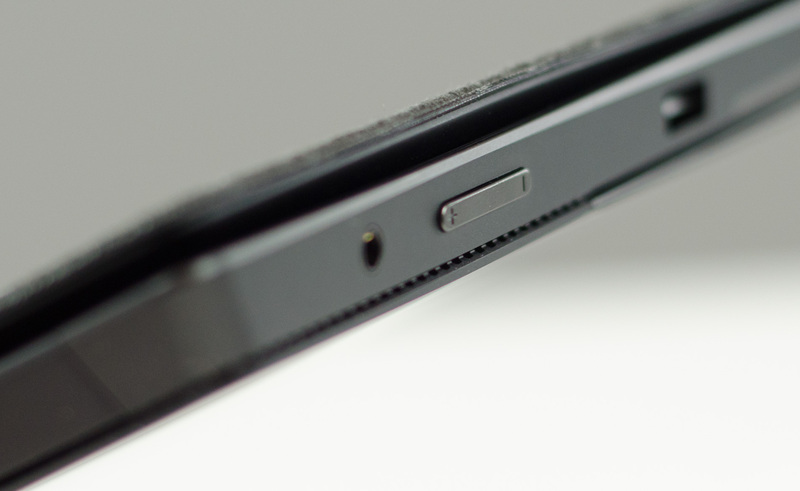 The rear facing camera is also angled to compensate (it shoots parallel to the ground with the kickstand opened). The kickstand is allegedly good for over a million open/close cycles and it still doesn’t feel like something that would break. There are only two hinges in the kickstand compared to three for the RT model. The kickstand on Surface Pro feels different than the kickstand on Suface RT. 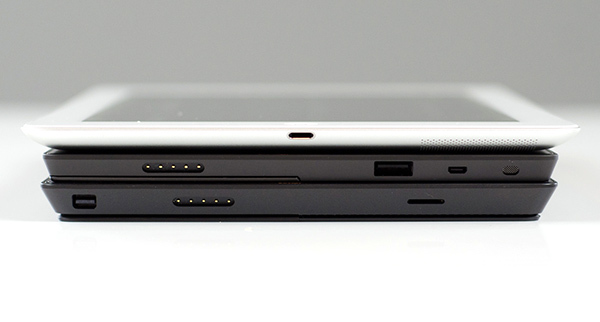 The Pro kickstand feels lighter and sounds less like metal and more like plastic if you tap on it. Feel around on the underside of the kickstand and you’ll notice a coating that seems to dampen sound and perhaps add some structure reinforcement to the design. 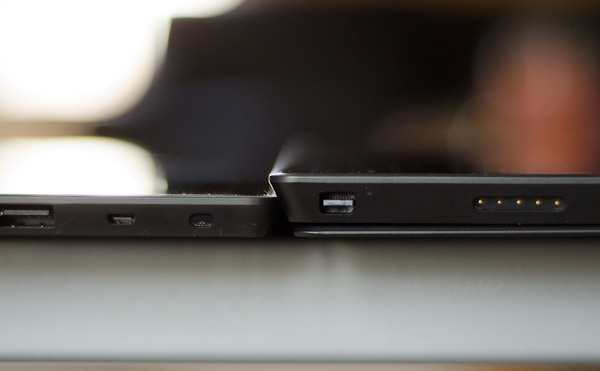 Microsoft had to thicken the kickstand to support the added weight of the Surface Pro, but the difference is on the order of a fraction of a millimeter. The tweaked kickstand does have different acoustics than Surface RT’s kickstand. While the latter sounded a lot like a thin metal door shutting, the Pro’s kickstand is far more muffled. I’d almost say it’s preferable. 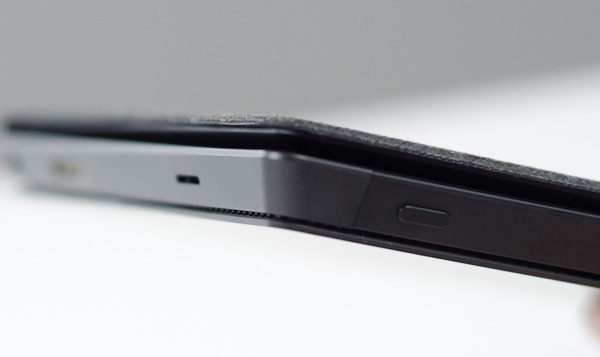 Thankfully the kickstand’s functionality hasn’t been marginalized in the transition to the Pro. It’s still a highly integrated and very important part of the Surface experience. It’s simple to flip out and perfect for use on desks. You can make the kickstand work on your lap or chest if you’re lying down, but it’s not ideal for either unfortunately. The more I use Surface (Pro and RT) the more I feel that Microsoft needs to pursue something a bit more flexible than the fixed 26-degree kickstand. The biggest issue by far is in-lap use with one of the keyboard covers attached. Depending on your seating position, the 26-degree angle that the kickstand opens at might be too small. Mechanically I don’t know the right solution for Microsoft but I do feel like for the kickstand to realize its true potential, it needs to be able to open and hold at multiple angles. It doesn’t necessarily need to have support for infinite angles, maybe even a few would work, but I do believe it’s necessary going forward. A key feature of laptops is that they function on your ...lap... (or other surfaces which are not flat or angled.) Juggling the kickstand and the hinged keyboard is cumbersome at best for most non ideal use scenarios. And frankly, if I am set up with a flat table and room to work, I hope I have my 15" notebook with me. Agreed. It's basically the upgrade from the Tablet PC's before the IPAD was born. I still have a Motion Tablet PC (LS800) in my office and the only reason I don't have Win8 installed on it is the screen resolution limit. The Motion Tablet PC resolution is a very small/old 800 x 600. 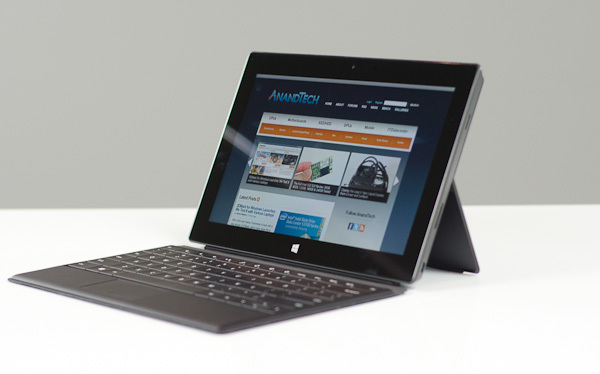 I like the fact that Anand did a dual comparison between today's tablets and ultra-books for the Surface-pro. Regarding the issues on lap use, I believe the addition of a keyboard dock similar tot he transformer would allow the Surface to convert between being a tablet and ultra book when the user needed/wanted. All in all, I think MS has a good start. Now with newer/smaller CPU's from Intel or AMD (if they can get their die smaller) will allow MS to be even more competitive.